To me ‘seriously nutty’ suggests the presence – perhaps even an abundance – of nuts. And in the case of a pistachio ice cream, pistachio nuts. Call me an idealist, but if an ice cream is labelled as ‘nutty’, I’m expecting a whole load of the good stuff. What I wouldn’t expect (although perhaps on reflection with my cynical anti-supermarket – which is where I found this particular imposter – hat on, I would) is an ice cream flavoured with ‘pistachio sauce’. A sauce which, on examination, is made up of sugar, colouring, spinach extract, curcumin, flavouring, rice starch and, conspicuously, no pistachios. Seriously nutty? If you take the term nuts to mean crazy, perhaps. Upsetting as it is, there’s a simple reason behind these devious hidden ingredients: pistachios are expensive. Ice cream makers the world over use artificial ingredients (in its defense, at least the tub I was looking at used natural colouring like spinach) and finding a top quality pistachio ice cream is difficult to say the least. Unless you make it yourself. A few months ago I discovered Bronte pistachio paste, a sort of sweet, green version of Nutella made with Italian pistachios, sugar, milk powder and fat. Delicious as it is (I could eat the stuff by the spoonful), these add-ins mean it’s not the purest of ingredients to work with, so I was thrilled when the founder of Why Nut offered to send me some of their 100% pistachio paste. I don’t normally review products on my site, but I’m more than happy to mention something as wonderful as this. Why Nut pastes are used by master chocolatiers like William Curley and Rococo and the intensity of colour and flavour is next to none. Think Nutella versus a spoonful of melted chocolate, both delicious, very different, but the latter more adaptable to use in different ice creams and desserts. Just over a litre of ice cream below is made with about £5 worth of pistachio paste. Add in the other ingredients and it’s going to come in a fair bit more expensive than a shop bought tub. But it’s worth it because it’s better. Cloaked in chocolate then sprinkled with salty pistachio nuts, this pale green ice cream is an utter joy to eat. And seriously nutty in exactly the right sort of way. The beauty of these little ice creams is in the silicone moulds (which you can pick up online fairly inexpensively). However if you don’t have any, you could freeze the ice cream in a square container lined with parchment paper, then slice into bars before following the instructions to coat with chocolate below. In a medium bowl, whisk the egg yolks until pale and thick. Pour the cream into a separate bowl, sit it in an ice bath and set a mesh strainer on top. In a medium saucepan, heat the milk, salt and sugar until the sugar is dissolved. Pour the warm milk mixture into the eggs, whisking constantly until combined. Return the whole mixture to the saucepan and cook over a medium heat until the custard has thickened, stirring constantly to ensure it doesn’t catch or overheat. Remove the custard from the heat and pour through the mesh strainer onto the cream. Whisk the mixture over the ice bath until cool. Once cool, whisk in the pistachio paste. Chill in the fridge for a couple of hours or overnight, then churn according to your ice cream manufacturer’s instructions. When the ice cream is churned, transfer into silicone ice cream moulds and freeze. After an hour, insert your wooden lolly sticks then return to the freezer to harden completely. Line a tray with parchment paper and place in the freezer. Melt the chocolate and coconut oil in a heatproof bowl suspended over a pan of simmering water. Remove from the heat and allow to cool slightly before transferring into a tall glass (having the chocolate in a container with high sides and a narrow diameter will allow you to submerge each ice cream bar easily in the chocolate). 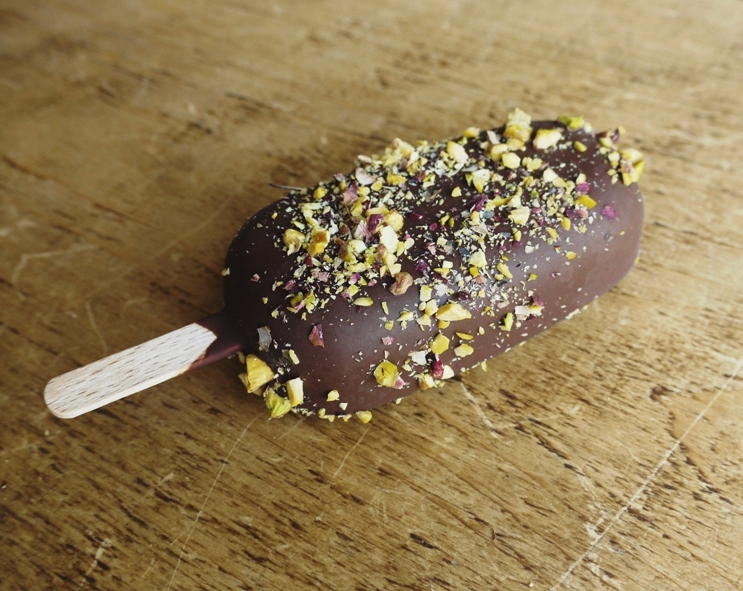 Remove the ice cream bars from their moulds and, working quickly, dunk the bar in the chocolate and remove, allowing the excess to drip off before sprinkling with the chopped pistachios. Lay on the parchment lined tray in the freezer and repeat. Oh my goodness. Pistachio ice cream is about my most favourite thing in the world. I need to make these right now! Pistachio ice cream is one of my favourite flavours, has been ever since childhood. And so I’m completely with you on the (sadly ubiquitous) cheap versions which often taste more like marzipan than pistachio, apparently because almond extracts are a common flavour substitute for pistachios. So when I come across examples made from real pistachios and which taste of real pistachios, I’m always thrilled. I had some wonderful chocolates from Artisan du Chocolat recently which used a paste like this. SUPERB! Dear Kavey, I am delighted to say that Artisan du Chocolat uses WhyNut pistachio paste, in their chocolate “O” s and “emerald pearls” as well as pistachios for “chocolated coated salted pistachios”…Anne Weyns was one of the first chocolatiers to recognize us, and I am greatful to her for that !! You absolutely must try it Kavey – delicious for ice cream and so much more! I’ve had so many disappointing experiences with pistachio ice cream but now I know where I’ve been going wrong. I could happily eat all 8 of these ice cream bars! Kate these look and sound so wonderful! Much much much better than the ‘real’ thing – actually, scrap that, I think yours are the real thing! Pistachio gelato is my favourite gelato flavour and Pistachio di Bronte is so good! And yes, it’s pricey, but I think it’s worth it given the incredible flavour they bring to ice creams, baked goods etc. These look divine – definitely worth the effort and expense to make! Pistachio ice cream is one of my favourite flavours, especially when served with chocolate/hazelnut. these look incredible… I’ll give it a try! Oh wow, I love this! They look absolutely gorgeous. Oh yum! We used to make pistachio ice cream using a ridiculously expensive pure pistachio paste from France when I worked as a chef. Sadly I can’t afford that for us at home, but I do adore pistachio ice cream. Love the moulds you’ve used! My lovely friend Nicola at souschef.co.uk sells a marvelous pistachio paste which we used to make a salted pistachio ice cream. YES, anything but real pistachio is just a sad let down. I have always LOVE LOVE LOVED all things pistachio (they remind me of my Grandad who always used to have a bag of them), so I can’t wait to try out these REAL pistachio pastes. I’ve been holding off giving my son nuts because the Health Visitor said I shouldn’t until he’s 2; well, it’s his 2nd birthday next week so I think I may make these with him as a special birthday treat. I can´t believe the spinach story, and they get away with it. Your nutty ice cream sounds terrific Kate, full of flavor as it should be! Pistachios are expensive but so worth it. Wow, these look amazing! Really striking photographs. I’ll have to give these a go myself as soon as the weather improves again. You’re every bit as much of a pistachio nut (pardon the pun) as me. These look lovely, and I couldn’t help myself going straight over to whynut and ordering their pistachio/hazelnut taster. Pricey, but I’m confident it’s going to be worth it. Thanks so much for the tip. Thanks Euan !! Your order is on its way 🙂 Added a complimentary tub of almond paste and taster pistachio kernels ! I’ve just been to the Why Nut page. That paste looks great. imagine if you swirled it through brioche. Drool. Thanks Sophie – toothpaste ice cream does not sound good! I can’t believe that ice cream was called nutty when it didn’t even contain nuts! Talk about false advertising! Your ice cream, however, looks fabulous, and those crushed pistachios on the outside look so beautiful. I just love pistachios, they are such a pretty nut, if there is such a thing! I wonder if the Why Nut paste, or something similar, is available in Australia. I think pistachios are pretty too – like little jewels. You could try emailing the owner of Why Nut – she’s lovely and am sure will give you some recommendations if they don’t ship to Oz. your bars are so beautiful. I would buy them (in truckloads)! I really do enjoy Ben & Jerry’s pistachio pistachio ice cream, and I do think there are at least some real pistachios in there because they have nut chunks throughout… but I am shocked by that “seriously nutty” claim of that ice cream brand you found! Madness. 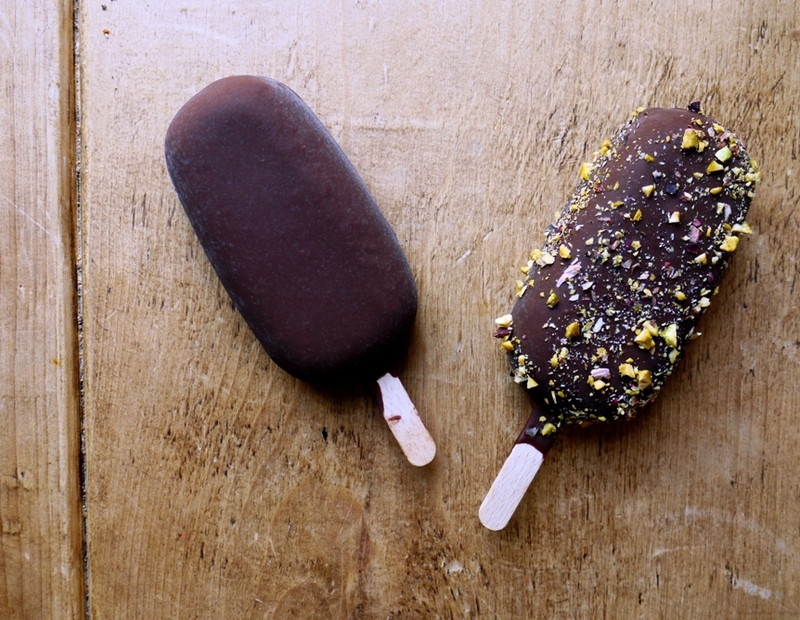 These ice cream bars sound infinitely better. You have outdone yourself this time – truly awesome! I adore pistachio ice cream (and agree that bought ones are generally disappointing) but have just found out my daughter is allergic to some nuts so this may be one just to dream about for now! I can only imagine your disappointment – I’d have been furious at being cheated out of my favourite nut! I think that pistachio paste sounds INSANE and would love to get my hands on some sometime. These look gorgeous – not sure I’d have had the patience to make them though, I’d probably have just spooned the nut paste onto a biscuit or something! The colour of the paste is amazing – this deep, rich green – and it smells divine. The moulds are great too and honestly doesn’t require a lot of patience – you just spoon in the ice cream, let it set then coat in chocolate! How utterly scrummy! Something very more-ish about Pistachio ice-cream. My dad loves pistachio ice cream… he would adore these! 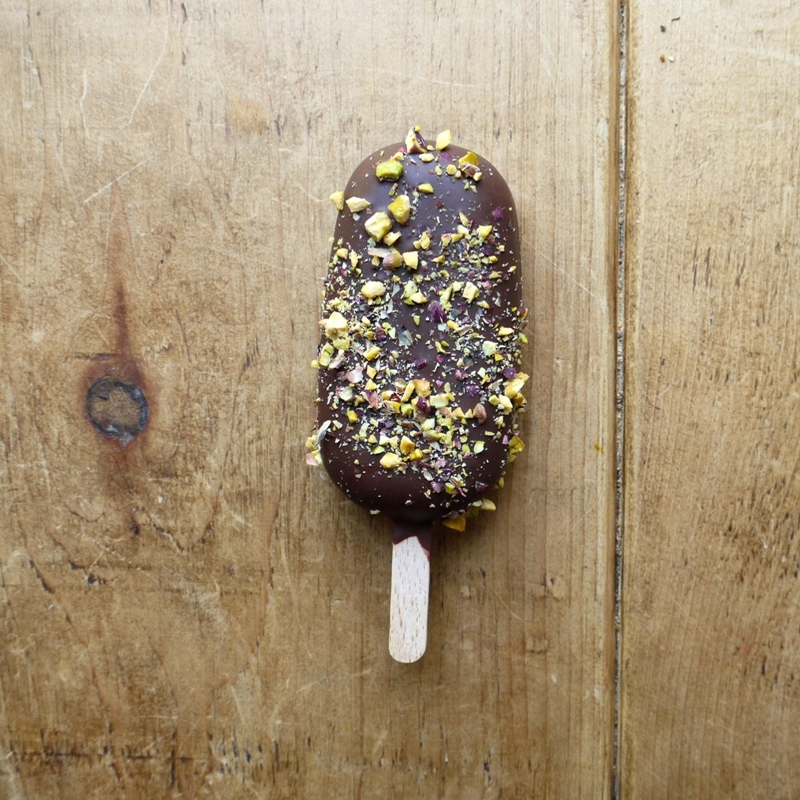 That, my dear, is my ideal ice cream: pistachio, covered in chocolate, with pistachio crumble… on a stick! That looks A.M.A.Z.I.N.G. I love pistachio ice cream! 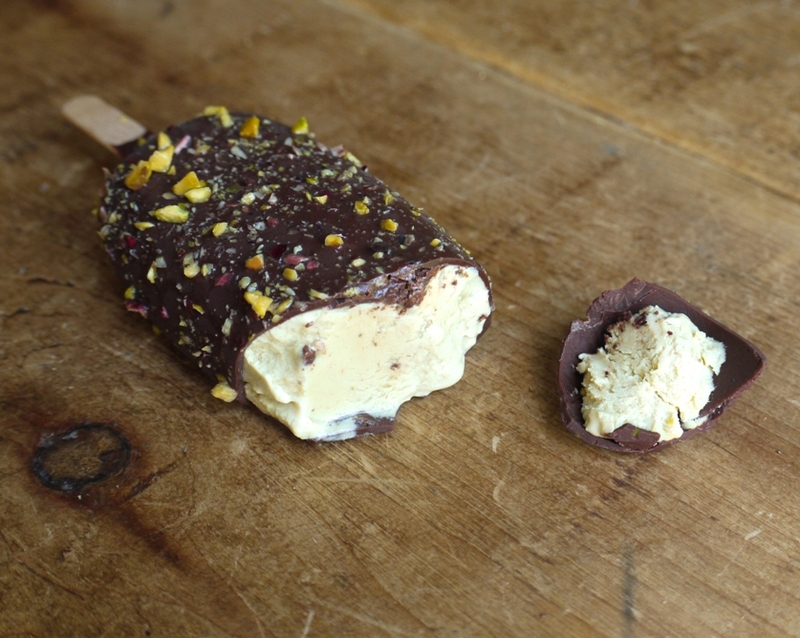 You can make ice cream bars at home!? Whattt? 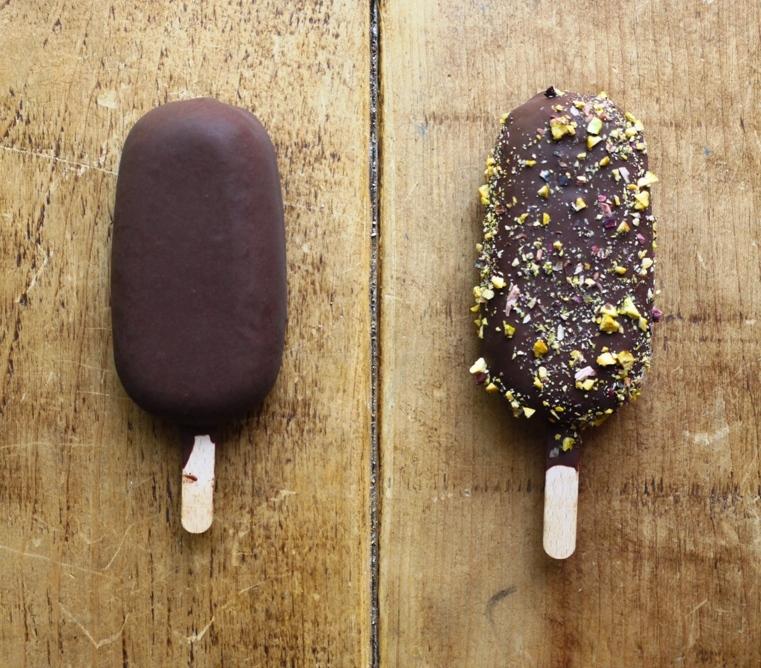 These ice cream bars look fantastic! I will have to try making this over the summer! I would totally make these. And I really want to, they look perfect.. come on sun, please shine! Reminds me of the chocolate almond Magnum Bars that I lived off of in Thailand. I would love to make these, but first, I need to work on my self control. They look so incredible, I am sure I would eat them all in a week. P.S. they look AMAZING, your photos are always so appealing!